My daughter always talked about a wonderful cake called Pea Pick’n Cake when she was young. The only problem was the mother who made the cake would not share the recipe. That was before Paula Dean and internet. This was not uncommon for recipes to held close as a cook’s secret . It was done to protect their special status as to being asked to make or be paid to make it. So I paid her one time to make it for her birthday. I had dropped my cake plate off so the cake could be used and paid her. When I picked the cake up, it didn’t take me but a few minutes to realize that it was a Florida Sunshine Cake that I had made before. Some of the other names for this cake is Celestial Snow Cake, Orange Pineapple Cake and Pig Lick’n Cake. How did this orange pineapple cake end up with some many names? Hotels in Florida would serve a orange cake made with mandarin oranges topped with pineapple whipped cream or butter cream. In the early days there was not much refrigeration and canned products were used. So canned milk and fruit was what was available for chefs to use year around and convenient in this hot climate. The famous key lime pie was made from canned sweetened milk, eggs and lime juice. Another traditional cake was the Daffodil Cake. This was a Easter sponge cake that was filled with pineapple jam and covered with pineapple whipped butter cream frosting. Sponge cake was leavened by whipping egg whites full of air. Modern baking powder was not available until 1900 that was reliable. Many cooks had their own special twist for this seasonal cake. Some cooks in different regions just matched up their daffodil frosting to a mandarin orange cake. They also took advantage of convenient products like instant pudding mix, cake mix and whipped toppings. In the southern states like Georgia and the Carolina’s, pig roasts or barbecue pork roast are called pig pickings. A whole pig is roasted over a barbecue and then the meat was picked off. These barbecues are special events and everyone brings their favorite pot luck dishes and desserts. This cake became a favorite dessert at these events and became known as pig picking cake. In the Tennessee area during hog killing time and sausage and ham making events among farmers, this cake became known as pea pick’n cake. Farmers would get together and help out with this chore at each other farms and the ladies would provide a covered dish meal. By the time the 1980’s rolled around this was a very popular cake and the recipe had made it into newspapers and women’s magazines the decade before. It was given many different names but the fact remained that this cake has it’s roots in the south. Preheat oven 350 degrees. Prepare 3 round cake pans with vegetable spray and parchment paper on the bottom. Save a few mandarin oranges for decorating the top of the cake after frosting. Mix all ingredients in a large mixing bowl using an electric mixer on low speed until blended. Pour evenly into the three pans. Bake at 350 degrees for 20-25 minutes or until cake tester come out clean. Cool for 10 minutes and remove from pan to cake racks to finish cooling before frosting. Blend instant vanilla pudding and pineapple with juice. Let thicken for 5 minutes. Fold in the container of thawed whipped topping until blended. Frost cooled cake. 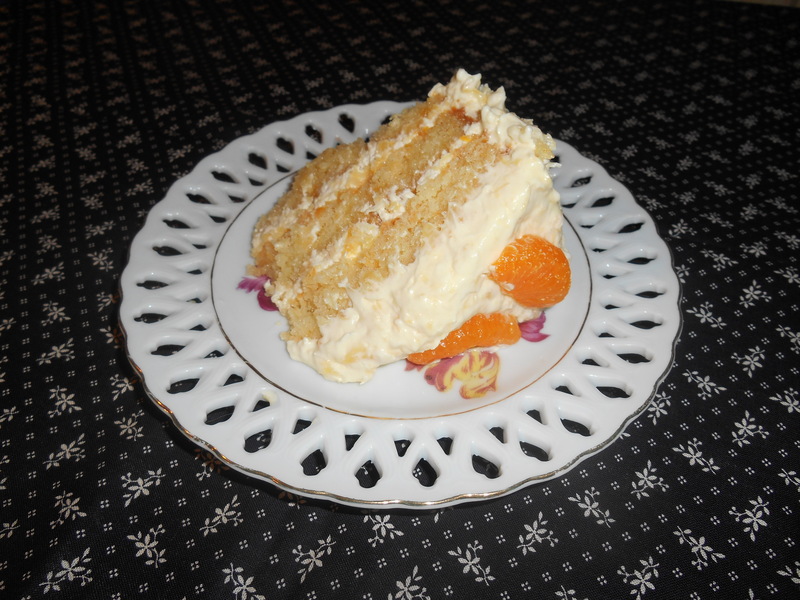 Sprinkle cake with toasted coconut and garnish with saved orange sections. Keep cake refrigerated. Previous Post Cats Cradle Quilt Block-Sampler Quilt. Interesting background on this. As a Yankee, I’ve never even heard of the cake! It is really a good cake. It is light and not too sweet. It is a good cake to take to a covered dish. You will get lots of complements if you do. It is also very easy to make. You were quick. I just got my editing done. The link was not working so I had to fix it. The recipe site is a good one to follow. She collects a lot of interesting recipes. Yummy cake that can be adapted using sugar free ingredients and made also in a 9 in, x 13 in. baking pan. Enjoy! This looks SOOOO GOOD…..printed the recipe and will have to try it! I had to fix the link to the recipe. It works now. It is a good site to follow for recipes. Some of my very old cook books have recipes for daffodil cake. It was made usually for Easter and in the springtime. I guess it got it’s name from the rich yellow sponge cake. I hope you try the pig picking cake. It is really light and yummy. Thanks so much for the link to my blog post. I loved the additional information you shared about the cake. I am really inspired about the frosting on this cake and I plan to use the instant pudding and sugar free cool whip with strawberries to make a diabetic dessert for Mr. D.
You always offer very doable recipes from your collection. I have made several of them over the last 2 years. I like to point out a blog if it really interesting. I hope you get some new followers from this. I knew this cake had a interesting history connected to it. I also was hungry for one after I saw your blog. It had been a while since I made one. Thanks for stopping in. . I love the story behind this cake! I have never heard of it or of daffodil cake, but I love pineapple upside down cake! I have a good recipe for pineapple upside down cake that is from the early 1950’s. It was one of the first cakes I learned to make as a kid. It is completely from scratch. I also love that cake too. I will have to make one soon. Thanks for the history on this cake. Twenty years ago, one of my husband’s co-workers would put on a pig roast every summer. He lived in a town in Indiana with the great name of “Bright” and the roast was as you described with everyone bringing a favorite dish. I couldn’t believe my eyes when I walked into the kitchen and saw all of the desserts that had been contributed. Every surface was covered and I’d bet that this cake (under some name) was there. It is a good cake and you would like it. Ok, now we have a problem…… I want cake. This sounds like a lovely cake and perfect for this time of year. We are having a fish fry soon and this cake is now on the menu. THANKS! You will enjoy it and if you are having guest be prepared to share the recipe. I once had a piece of “Sunshine Cake” decades ago during s Florida vacation. It was good enough that I never forgot it. I’d no idea of its history, though, nor that the recipe itself was so old. Very interesting. Thanks for doing the research and sharing it with us. After the train made it into Florida, many wealthy would travel to Florida to spend some winter months in the sun. Foods were created by the local cooks and trained chefs to cater to the wealthy visitors. Pineapple grows well and so do oranges but canned fruit was always easy to get and use. My husband’s great aunt used to tell a story about when she was a little girl in Akron before WWI. At Christmas a family friend gave them a box of oranges and grapefruit and they hung them in netting on their Christmas tree at Christmas Eve. She said that was the first time she had ever seen such fruit and could not wait to eat it. It was such a luxury and exotic treat. Serving a orange and pineapple cake had to been something that was truly amazing and was kept up as tradition. Southern states were close to where the fruit was grown so they had better access to it. Thanks for stopping in John. I love history!, I have a lady at church who makes this cake and calls it Orange sickle cake. That name fits it really well. Now you have the recipe and you can make it too. It is a good cake. One that will get you plenty of complements. Enjoy! I can remember eating Daffodil Cake in the 1960’s. It probably was the version made with pudding mix, cake mix and whipped toppings–since mixes and other processed foods were considered “cool” back then. Cake mix sales had flatten out then so they started marketing ways you could make them into specialty cakes. Pudding was one of the items they were trying to lift the sales on. Many women had gone back to work and was baking less. There was the whipped topping that came powered that you added milk too that was promoted also with the cake mixes. Canned frosting was something new then also. One of my favorite cakes then was the Tunnel of Fudge Cake. It was a bundt cake that you mixed powdered fudge frosting in and it made a fudge center. You can’t get that frosting any more but I have made it with 2 small boxes of jiffy chocolate frosting mix. They used to have sponge cake mixes then also. I remember lemon sponge cake mix. They have been gone for a long time. Today I buy mixes that are on sale or discontinued. I got 6 boxes last week that are just about to expire on their date. I paid .68 cents each. I am going to make cookies out of them. One of them was used in this cake. Give this recipe a try this summer. You keep it in the refrigerator so it is a really cool snack on a hot day. Thanks for sharing one of our family favorite recipes. I an vouch for the fact that I can adapt this for my diabetic husband and will not be surprised if he request it for Father’s Day. Thanks for your comment. I have been upgrading my page. I have about 60% done. I am surprised at all the traffic since I started this.